For over 100 years, mining operations and a massive cement plant had scarred over 1,200 acres and five miles of Lake Michigan shoreline on Little Traverse Bay. After the industry played out and the land lay desolate, various developers tried to reclaim the site. All of them failed. Then, in 1993, David V. Johnson dreamed of transforming this abandoned moonscape into the most luxurious residential community on earth. The undertaking became the largest land reclamation project in North America. On July 12, 1994, his dream became reality with Governor John Engler on hand and thousands of spectators looking on, explosions demolished the century-old cement plant smokestacks. What followed, in March 1995 was another “big bang” – the explosion that would blast away the barrier between Lake Michigan and a quarry letting water rush in at one million gallons per minute. Within 24 hours, over 2.5 billion gallons would form the new “Nautical Center of the Great Lakes” in Bay Harbor Lake. The vision was always to create the ultimate lifestyle, a year-round resort graced by boutique shopping, a deep-water marina, premier yacht club, equestrian center and a premier golf course with more water frontage than any course in North America. All of this would be part of a greater community which encompasses 32 neighborhoods, each with its own uniqueness including the tranquility of woodland living in The Preserve to the Victorian charm of Village Beach. 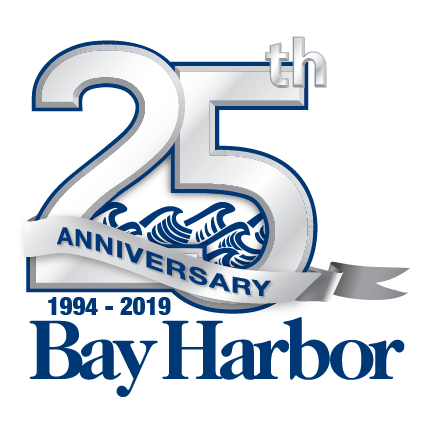 Bay Harbor was built to be generational – for families to come and enjoy the amazing beauty and hand it down to their kids and grandkids. The plan was to keep it low-density, with generous use of nature preserves with homes high on a bluff, or at the water’s edge or on the green of a championship golf course; all meticulously carved into the natural landscape and wrapped around Little Traverse Bay. In just 20 years, there are property owners from around the globe and thousands of visitors who grace the community to attend premiere events and enjoy the world-class amenities throughout every season. What will truly be amazing is to see what the next 24 years will bring.